Are you registered to vote? Tuesday, October 14 is the voter registration deadline for the November 4 Oregon general election. 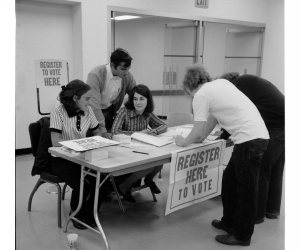 A voter registration drive at Portland State in 1971. Photo from the University Archives Digital Gallery. You can register to vote on campus, at tables in between Smith and Cramer and Smith and Neuberger, on Monday until 5pm and on Tuesday until 3pm. Can’t make it to campus or need to update your registration? Register to vote or update your registration online, through the Oregon Secretary of State’s website. Learn more about the November 4 election from the Multnomah County Elections Office. Live outside of Multnomah County? Find your county elections office here.